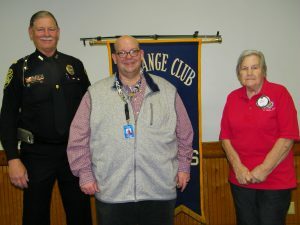 The Waycross Exchange Club hosted Steve Bené, Activity Director of the Georgia Baptist Children’s Home and Family Ministry. He plans activities for the residents in care. He also coordinates activities with churches and organizations that want to minister to their residents. He speaks at churches and organizations related to this type of ministry for their residents. He also speaks to them about how to partner with the master ministry headquarters. Their goal is to show love of Jesus Christ. Training allows them to act as parents who couldn’t or wouldn’t do, like tutoring, living skills, personal hygiene, coping skills, and more. Life is tough and they minister to their spiritual needs as well. They have 60-65 kids, many who give their lives to Jesus Christ. Groups come to minister many times a year. DFACS recommends many kids, parents, grandparents to be helped. They have helped 200 kids through the program.